The Forbes Pigment Collection, located in Cambridge Massachusetts, at the Straus Center for Conservation, is home to a vast collection of brilliant pigments collected from all over the world. 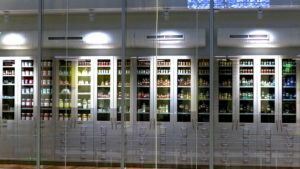 The collection is housed at one of four research centers under the umbrella of the Harvard Art Museum. The collection is impressive by any standard. The collection was started in the early 1900’s by Edward Forbes and it continues to grow. Currently it houses about 2500 samples. If you add historical binding media and equipment there is over 3600 samples! In addition to all the ancient pigments, the museum has begun to collect contemporary synthetic pigments of the last seventy years. The impressive collection are some of the tools the dedicated labs at the center use to analyze the structure and identity of works of art. In 2007 the collection was used by researchers to determine the authenticity of several paintings thought to have been painted by Jackson Pollock. 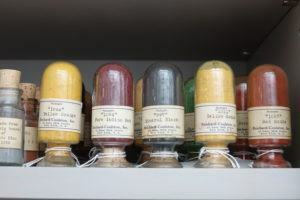 The Forbes Pigment Collection helped prove that several of the pigments on these paintings were first manufactured in the late 1960’s and early 1970’s. Pollock died in 1956. This panorama of color, displayed in glass jars and tubes of various sizes and sorts, has pigments ranging from the benign and ordinary to the exotic and rather toxic like King’s Yellow (contains arsenic) or Mercadmium Orange (contains mercury, cadmium). 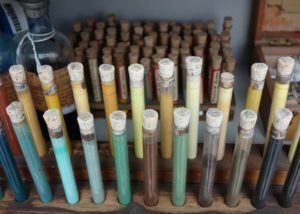 Many of these pigments have interesting stories associated with them. Mummy Brown. Also known as Egyptian brown, was made from White Pitch, Myrrh and ground up ancient Egyptians (Mummies). Indian Yellow. Made from the dried urine of cows. 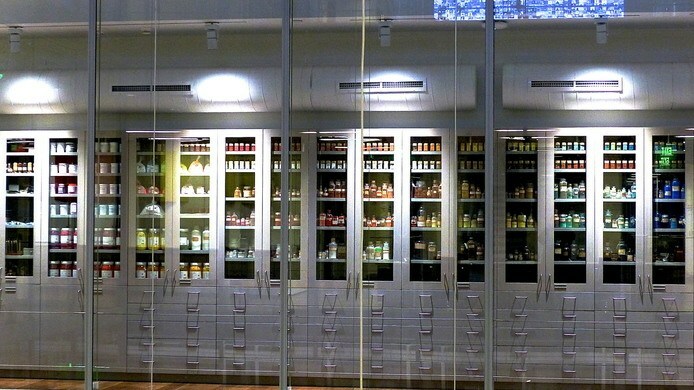 More detailed information on the Forbes Pigment Collection can be found here.